I have been hacked. Sad I know. D: LoOOOKK!!! I mean Im on the line with bliz and what not. Damn. Computer Haxxors. 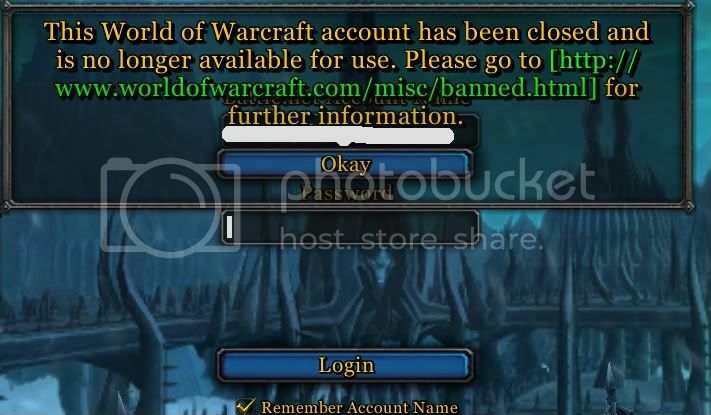 I don't understand how they reroute the emails from bliz so i'm completly unaware, until i recieve the Account Closure and Character Transfer Failure Notice. and better question: do you have an authenticator? I'm Trying!! That's what I get for being a pro though, people will do anything to be me! also, what kinda retarded hacker CLOSES an acct? that makes no sense. I had 7k gold, and it was banned for exploitation, i.e selling gold. He must have traded it to another character, therefore being banned because, 7k to a random character. THen it seems he/she tried to transfer a character. But failed. Bah, they can trace the credit card hopefully and i dunno, ban him. Going easy on him/her. I WANT MY COMPETITION BACK BEFORE 25MAN. make blizz fix you. kk? I know, I can't have you being the highest DPS chicken without me putting you to the test. Bah. I dunno, I'm trying to think what I did. I don't have Keyloggers, I did that whole scan and what not. But I dunno, honestly. same, but since i started "endgame" raiding when ulduar came out (i are nub). how do i not get hacked? i hope this authenticator does it for me. Well now, if that's not jinxing yourself, I don't know what is. Well, the Ticket is in. So, I'll be posting here to update. Have fun runnin' around Dalaran while I have to live in the real world. Order has been placed for blizzard authenticator.